There is no effective vaccine to protect swine from the disease. The rapid onset of the deadly African Swine Fever (ASF) in China has been detected in areas a thousand kilometres apart – posing an imminent threat to other Asian countries, the United Nations Food and Agriculture Organization (FAO) warned on Tuesday. While the deadly pig virus poses no direct threat to human health, there is no effective vaccine, and outbreaks can be devastating as the most virulent forms are 100 per cent lethal in infected animals. “The movement of pig products can spread diseases quickly and, as in this case of African Swine Fever, it's likely that the movement of such products, rather than live pigs, has caused the spread of the virus to other parts of China,” explained Juan Lubroth, FAO's Chief Veterinarian. China is a major pig producing country, accounting for about half the global population of swine, estimated at 500 million. Its value chain encompasses a sweeping range of producers, from small family farms to large-scale commercial operators. To control the disease, Chinese authorities have culled more than 24,000 pigs in four provinces. Although African Swine Fever has before been detected outside of Africa – including outbreaks in Europe and the Americas, dating back to the 1960s – its diverse geographical spread in China has raised fears that the disease will move across borders to South-east Asia or the Korean Peninsula, where trade and consumption of pork products is also high. The robust ASF virus can survive in extreme weather conditions, and even in dried or cured pork products. 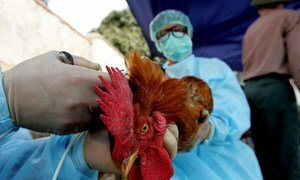 This particular strain is similar to one that infected pigs in eastern Russia in 2017 but, to date, the China Animal Health and Epidemiology Center has found no conclusive evidence of its source or linkages. FAO’s Emergency Centre for Transboundary Animal Diseases (ECTAD) is monitoring the situation with the Chinese authorities to respond effectively inside the country, as well as with authorities in neighbouring countries, to raise the importance of response preparedness. “FAO began working with China’s Ministry of Agriculture and Rural Affairs a few years ago and, together, we have set up an ASF contingency plan and developed diagnostic capacity,” said Wantanee Kalpravidh, FAO-ECTAD's regional coordinator. While the priority is to quickly stamp out the virus, restricting animal and pork product movements could undermine those efforts, warned FAO, saying that it could lead to illegal transportation. “Outbreaks such as this one are important reminders to us all that we must work together in a multi-lateral and inter-governmental effort to prevent and respond to outbreaks of animal diseases because these diseases know no borders,” said Kundhavi Kadiresan, FAO Assistant Director-General and Regional Representative for Asia and the Pacific. “Good communication and coordination with the region’s private sector is essential to strengthen cooperation in ASF prevention and control,” she concluded. More than 4,700 veterinary health professionals who have just completed a United Nations training to tackle disease outbreaks are the new front line of defence protecting farm animals against deadly illnesses in 25 countries across Africa, Asia and the Middle East.